According to a 2013 Quinnipiac survey, approximately two-thirds of Americans find the federal income tax system to be too complicated, and therefore resort to outsourcing the work of filing to a third party. More often than not, those who choose this option pay hefty fees for the convenience of having their taxes prepared for them. Thanks to Beta Alpha Psi’s (BAP) new tax assistance program, however, come tax day, you won’t have to pay a dime. Started last year by 2016 MS Accounting/MBA alumnus Joshua Jarecke, the Volunteer Income Tax Assistance program (VITA), provides free tax help to those who meet income eligibility requirements. Although new to CU Denver, the VITA program itself is decades old. Started in 1969 by the IRS, the VITA program sprang out of a problem running rampant at the time: tax preparers swindling low-income filers by way of charging inflated fees and rates. 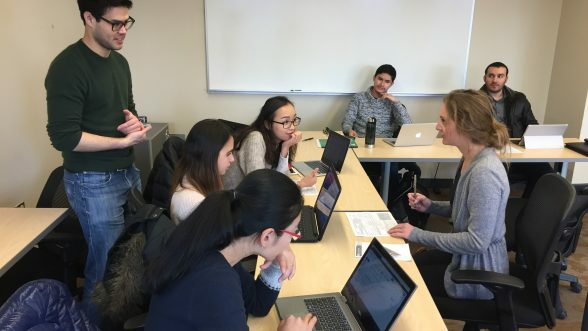 To combat this, a tax law instructor and IRS agent Gary Iskowitz, working in concert with the IRS, assembled a team of his students at California State University Northridge to offer free tax help to low-income residents in the area—the program took off. More than 40 years later, VITA has spread everywhere from community centers to universities across the country, with the goal of not only giving back, but also providing student volunteers with a valuable hands-on learning experience. BAP members get hands-on experience with tax returns. Driven by the same mission, Jarecke, the founder of CU Denver’s VITA program turned staff advisor, and Daniel Aronson, BAP’s Senior Vice President for VITA and MS Accounting/MBA candidate, hope to bring their tax expertise to those most in need at the university. “Our goal, first and foremost, is to serve all members of the CU Denver community—staff, students, faculty, and alumni,” said Aronson, who shares Jarecke’s philosophy of spreading financial literacy to all. The volunteers are qualified: Each student volunteer is VITA program certified, meaning that they’ve passed a series of exams through the IRS proving their proficiency in processing and handling sensitive tax information. You must be eligible: in addition to having an affiliation with CU Denver in some capacity, those wanting to participate in VITA must not exceed $54,000 in annual income—this includes couples filing a joint return. The program also aims to provide services to limited English speakers and persons with disabilities. You must show up with the appropriate documentation: a photo ID and a social security number are required in order to process each return. In addition, tax information such as W-2s, 1095s, 1098s, 1099s may be needed, depending on your circumstances. If you are not sure as to whether a document is relevant or not, please bring it with you just in case. Mark your calendar: The BAP VITA program will have a physical site set up every Thursday from 11 a.m. to 3 p.m. in business school room 3006. This program will run until April 13th. Carve out time: While the processing time for each return is expected to be low, please keep in mind that the process can take between 20 to 45 minutes, and that you must be present for its duration. For more information on the BAP VITA program, please visit their webpage.